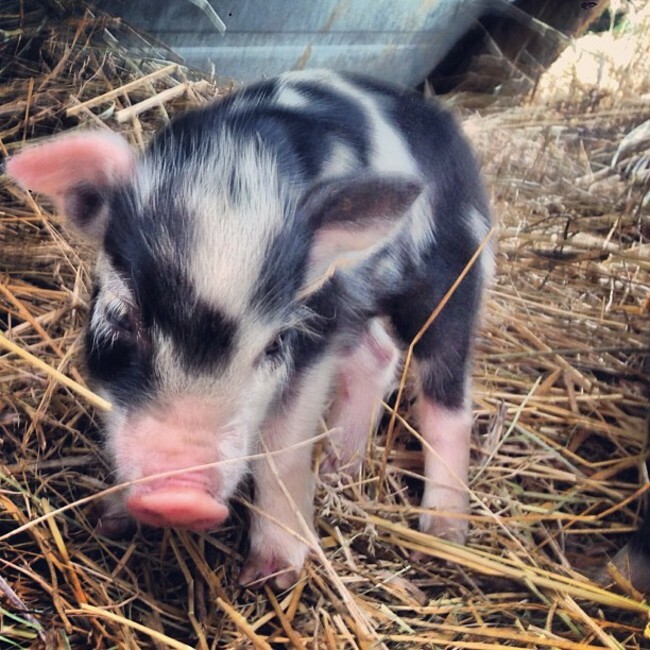 On Saturday I wrote about Bianca's farrowing and the fact that one of the piglets didn't survive. I learned from the piglet's death that piglets are extremely fragile when first born, highly susceptible to cold, and if not immediately cared for will most likely expire through no fault of their own. I wrote Saturday's post in a kind of stream of consciousness. It helped a lot to get it out on paper and force me to think about it. Immediately after I published the post I went back out to check on Bianca, who was still laboring and was expected to birth another 4-5 piglets over the course of the next hour or so. I wanted to bring more hay and food for her, and to check on the rest of the piglets to see if any of them needed help. Eileen had yet to see the piglets, so we jumped on the ATV and headed out to their paddock. First thing we saw upon arriving was a lone piglet covered in afterbirth under a tree. Bianca was with the rest of the litter in her nest. Five piglets were with Bianca. We knew that little piglet under the tree didn't stand a chance on its own and it was already on the brink of death, most likely unable to survive if we simply placed it back in the nest, as I had done with the last one. So we took her inside and gave our best shot at nursing her back to health. 1.) Piglets need to be really, really warm. We put her in a hot water bath to clean off the afterbirth and immediately dried her off, wrapped her in a clean towel and put a hair-dryer on high to warm her up. 2.) Piglets need warm milk fast if they are cold. You can warm up the piglet's body all you want, but if you don't get warm milk inside their belly they will not warm up completely. We thawed some goat colostrum and put it in a bottle to feed her. She wouldn't nurse on the bottle like the goat kids will, so we squeezed it in her mouth and she swallowed a little bit at a time. Eventually, she had taken down a couple ounces. Pretty good for a little piglet that must not have weighed much more! 3.) We kept blow drying her, being careful not to burn her, but also knowing that she needed to be very warm in order to recover. Within a few minutes she was trying to stand. A couple minutes later and she was standing. After that it wasn't even a challenge. 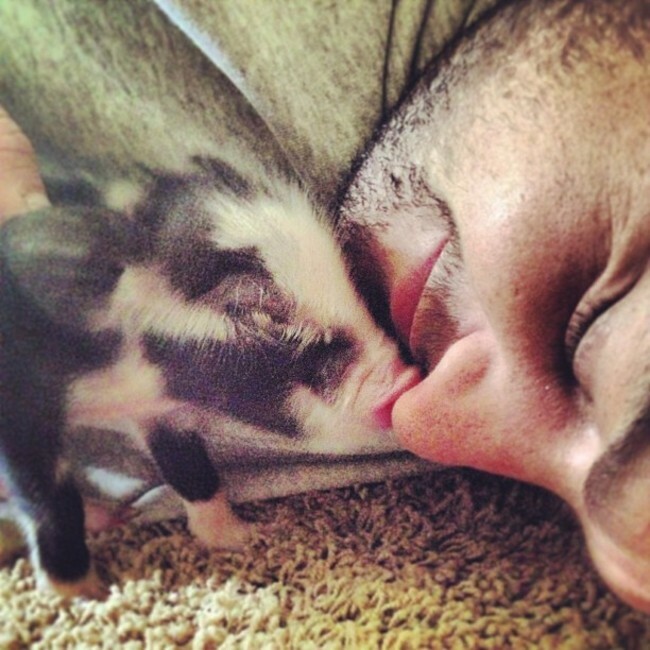 That little piglet was running all over the living room floor, chewing and rooting through the carpet as she went. She didn't really like the bottle so we filled up a small tupperware dish and she went to town on it! It was as if she were rooting through the milk. Typical pig stuff, reminded me of her mom drinking whey. They stick their whole face in like they're about to drown in it, blowing bubbles out of their little noses and grunting. Too funny. It really cheered us up. After a couple minutes of high-powered action she tuckered out. I took a brief nap with her on the floor and then she was back up and running. We hadn't thought much about what to do with her if she recovered, so at that point we weighed our options, which were two-fold: Either put her back or keep her in. If it were a goat we'd probably have kept it inside, but pigs are just different. We agreed she should go back with the litter and off she went. I plunked her in the nest and she piled right in with the rest of the piglets. Just where she belonged. Last time I checked she's doing great in there with the rest of the piglet crew. Piling up, taking naps, nursing on Bianca, and never venturing outside the nest into the cold, just like good little piglets. Bianca had 5 gilts and 2 boars. One gilt died. Thus far I've been really happy with her. She's been a great mom, all the little piglets look warm and healthy and active. 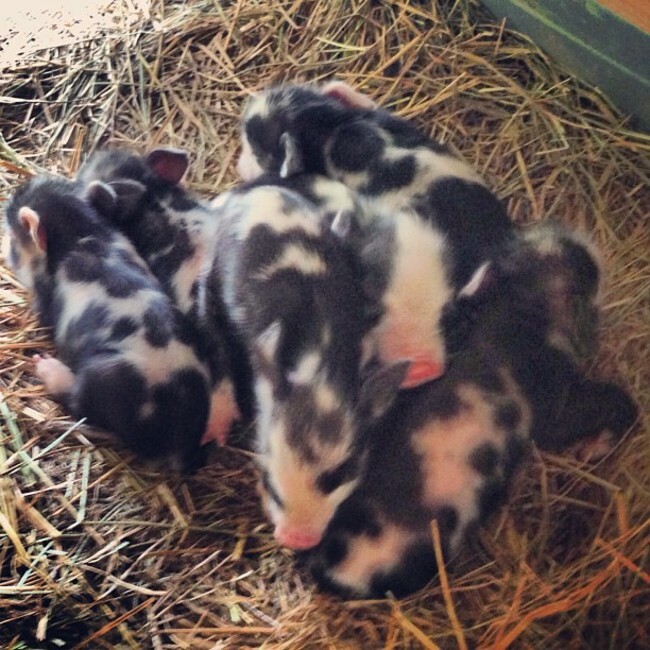 Seven is a good-sized litter for an Ossabaw gilt bred at 9 months. She's really mellowed out too, which is nice. That seems to happen with most animals after they give birth. Well, that was an eventful few hours on a Saturday afternoon. Glad you could join along.